Austin's parents came to visit during the second half of my spring break which worked out wonderfully (no need to skip classes or find someone to cover my teaching). It is the annual South By South West music/tech/cool stuff fest in Austin so they flew in with all the instrument toting hipsters and we decided to avoid the SXSW hot spots. For the first night, we planned to do some grilling to (finally) utilize our new patio furniture and take advantage of the gorgeous weather. Here is how the menu unfolded. 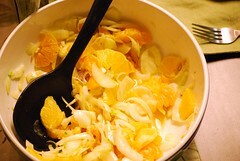 Orange Fennel Shallot Salad made by my ma-in-law, so refreshing and delicious. 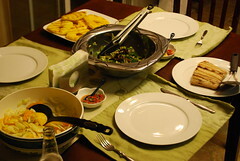 The spread including grilled swordfish with pineapple salsa and grilled pineapple circles. 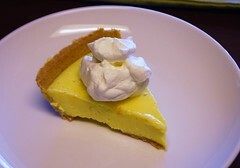 And for dessert, inspired Cousin K who was vacationing in Florida, Key Lime Pie. We paired the meal with a Torrontes, a recommendation that was perfect and arrived via a circuitous route involving my undergrad French adviser. 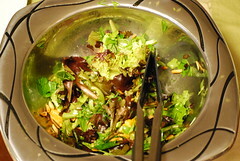 The meal, the company, and the conversation were fantastique.